Once upon a time, my biggest dream was to participate in the New York International Gift Fair (NYIGF) and we did it for the first time in August of 2012. The NYIGF has been by far the best wholesale show we have attended. Although we did not see the sales orders we anticipated during the show, we certainly followed up with potential clients and possible new accounts. Our sales orders came as expected along with the phrase: “It was totally worth it!” But the most special part of the event was meeting someone whose future work would greatly influence the growth and success of Evelyn Brooks Designs. I would like to share with my readers some special experiences I’ve had with one of our best sales reps yet. During the NYIGF show, a lovely lady named Clara Stryker from the U.S. Virgin Islands was among the people who visited our booth and loved our line. Being so impressed with our designs, she wanted to see if she could work with us as a sales rep. After the show, we followed up with our conversation and agreed to have her represent the U.S. Virgin Islands and Puerto Rico. In the beginning, we explained to her that this is a family business and as a result, she would become part of our family. Over the past months, Clara and I have learned to communicate very well. We both live in a very hectic world and do almost everything by email. 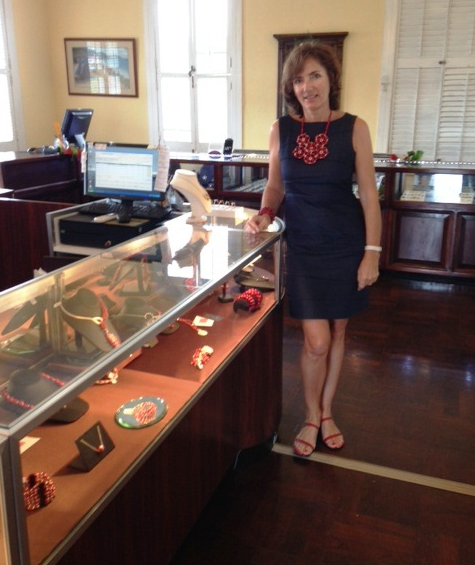 She is very proactive and extremely committed to our jewelry line. We are growing Evelyn Brooks Designs together, and I know we will need more Claras to continue growing Evelyn Brooks Designs. We understand it will be a long journey, but our plans are to continue expanding to several more markets. Being very organized and always on top of things has made her an exceptional sales rep. Communication is a key component to any relationship, and it’s especially important in the business world. I’m grateful of the amazing team we have formed together. Within four months of hard work, she was able to bring EBD to over twelve galleries and boutiques in the U.S. Virgin Islands. 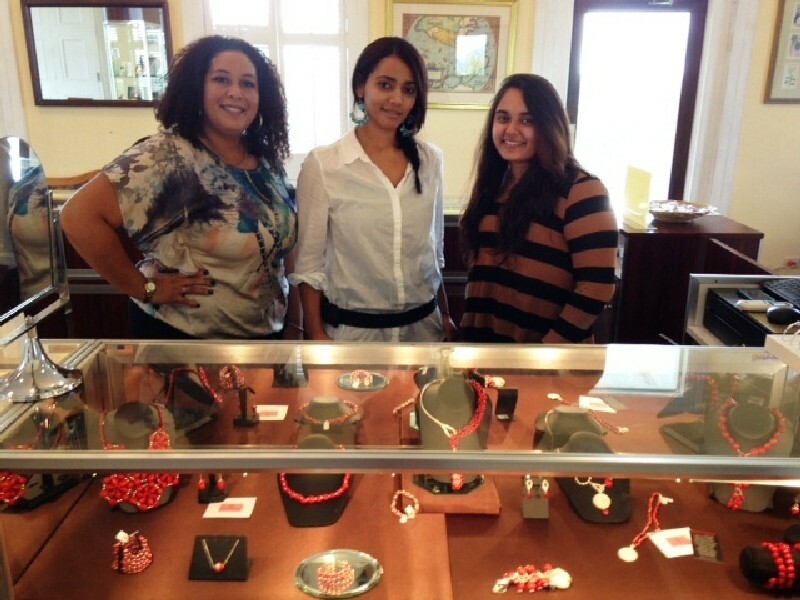 As someone with a strong committment to our jewelry line, Clara has organized jewelry trunk shows in partnership with different galleries. After delivering our jewelry collection to different retailers, she took the time to revisit and take photos of how our jewelry is looking on display. Let me continue with my story about what it means to be an effective jewelry sales rep. To be the most helpful and the most productive, you should always be thinking outside the box about new ideas you can bring to the table of whatever jewelry company you are representing. One day, Clara asked me if I could do a possible special order of 10,000 pieces for a client, and without hesitation, I said YES, we can! We made these beautiful silver heart charms exclusively for the world-renowned jewelry company Little Switzerland, which are only available from that retailer. For those of you not familiar with Little Switzerland, they have been around for over 50 years, with over 20 locations in Aruba, Barbados, Curaçao, Key West, Nassau, Puerto Rico, St. John, St. Martin, St. Thomas and Tortola. I remember going to a Little Switzerland boutique in Key West, FL and getting a beautiful black and white diamond anniversary gift for my hubby:) I’m therefore familiar with their jewelry, but I never thought in a million years that I’d one day design a piece for this store. Incidentally, I have to say THANKS TO MY SALES REP, this happened! Small entrepreneurial jewelry companies can grow more effectively when teaming together, and the sharing of suggestions and comments helps us become more successful. Even this morning I asked my husband to print a picture of me working in my studio so I could use it to apply for a show. He emails me back and says: “Can you take another picture? Maybe one where you are not working in your pajamas?” He is sooo right! And I am going to take that picture again. This is a family business and even my husband has the right to say something for the good of the company, right?